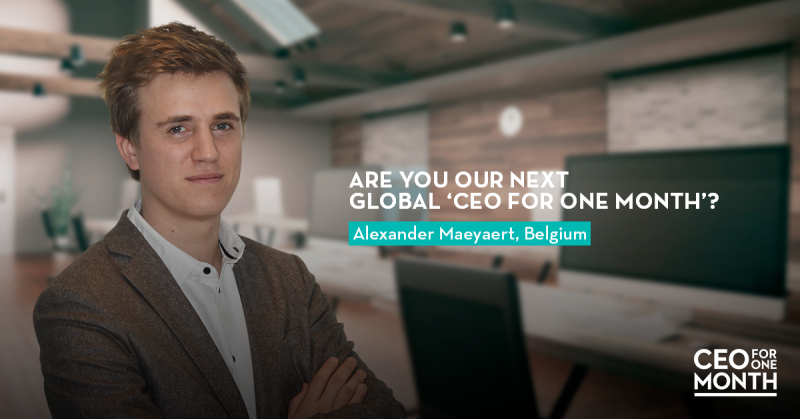 Like being given the keys to your dad’s car before even knowing how to drive, the Adecco Group’s ‘CEO for One Month’ programme is a powerful eye-opener for those who take part. Applications are now open for young people all over the world to enter the programme to become leaders across 48 countries in the Adecco Group’s global network. After completing their national ‘CEO for One Month’ assignment, ten of these talented candidates will be selected to attend a rigorous but inspiring boot camp where their collaboration and innovation skills will be tested. Only one will then be selected to work alongside Group CEO, Alain Dehaze, for one month. It is the experience of a lifetime and has a long-lasting impact on the individuals who take part. Youth unemployment is a well-documented global phenomenon. Each generation of school leavers and university graduates encounters increasing obstacles to entering the workforce. Over the last few years, the technological advances of the fourth industrial revolution have created jobs that require new skills and competencies which are increasingly specific. Against this background, education systems are starting to focus on technical and digital skills, governments are establishing more vocational oriented courses, and companies and organisations are working hard to provide work-based training opportunities like apprenticeships. Our ‘CEO for One Month’ programme specifically targets ambitious young talent, providing them with a life-changing opportunity. They can boost their employability by learning on the job at the helm of a leading multinational company. They literally get to experience what it’s like to run a company – it’s an amazing privilege and unique learning process. I cannot recommend the programme enough! It has changed my life. Nothing compares to sitting with Executive Committee members of a Fortune Global 500 company making real decisions about real life strategies. I gained exposure to the world of work, international business and a network of incredible people that would otherwise be unobtainable. To participate, candidates should apply via the Adecco Group Way to WorkTM website. Shortlisted applicants will be invited to an interview in the relevant participating country. The position includes a salary awarded to support the successful candidate’s education and development. Selected ‘CEOs for One Month’ will receive ongoing guidance and professional opportunities from the Adecco Group through the alumni group.